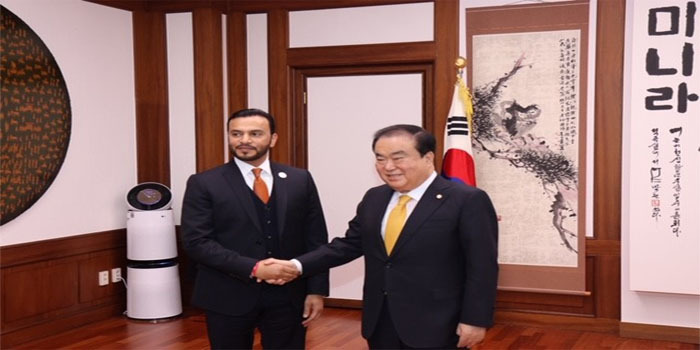 Abdullah Saif Ali Al Nuaimi, UAE Ambassador to South Korea, met with Moon Hee-sang, Speaker of the National Assembly of South Korea, on Wednesday. At the meeting, which was held at the Korean Parliament premises, the two sides discussed ways to strengthen partnership relations in various sectors in accordance with the parliamentary frameworks in force in Korea, in light of the special strategic partnership between the two friendly countries, which the leadership of both countries attaches great importance. The ambassador expressed his aim to develop more constructive cooperation that serves the two countries common interests, and said that he looks forward to greater horizons of cooperation in the future. The Korean Parliament Speaker, in turn, expressed the Korean side’s support and desire to deepen further ties of friendship and cooperation with the UAE across all levels.